Never remove more than one third of the grass blade when cutting the lawn!!! Thin patchy lawns are often the result of infrequent mowing or removing too much of the grass blade when you cut. Mow infrequently AND mow short and before long you won’t have a lot of lawn left to mow! Unfortunately this is common practice, and detrimental to the lawn. 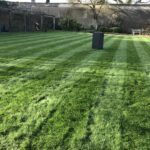 If your lawn mower is set for a 35mm cut, then you must mow at or before the grass gets to 45mm whether that’s 5 days or 10 days between each cut (depending on weather conditions or the time of year). That means you only remove one third of the grass blade. There is no harm done if you cut more frequently, so long as your lawn mower in good condition and the blades are sharp. This rule means you may have to cut your grass more often, but you can raise the lawn mowing height which will slow growth down. For example, if you set your lawn mower to cut at 50mm you must then mow at or before the grass gets to about 65mm. This may now mean mowing every 7 to 10 days depending on temperature and water availability. Regardless of the mowing height never leave your lawn more than 14 days between cuts. If you have a lawn mowing service coming every two weeks just ask them to raise the mowing height so that you stay as close to the one third rule as possible. The chances are in summer you won’t need to cut the grass as much if it is very dry as there will be little growth. However, don’t go over the two weeks between cuts because some weed grasses will take advantage of the lack of lawn mowing and spread or seed profusely. For the bulk of lawns, little and often means once a week. This will produce a much denser sward than if your grass cutting is every two weeks. A dense turf is the best looking and a great form of natural weed control as it prevents weed seeds from contact with the soil. If the seed doesn’t contact the soil then there is a very good chance that no weed grows. When growth is good (usually spring & autumn) mow at least every 7 to 10 days if using a rotary mower. THE RULE: Never remove more than one third of the grass blade when you cut the lawn.